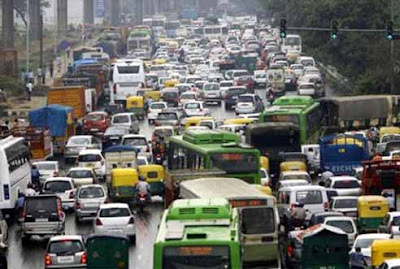 New Delhi : Amid controversy of implementation of Odd-even formula in Delhi, the Confederation of All India Traders (CAIT) today suggested of having variable office hours for the schools, courts, government offices, commercial markets and private sector in Delhi to reduce vehicular pollution in peak hours. While floating the suggestion, CAIT Secretary General Praveen Khandelwal, said that Odd-even formula has various constraints and will adversely affect economy of Delhi and mass scale inconvenience to people. However, pollution is a great problem and as such variable working hours could be a solution. Generally all offices open at 10 am resulting into much high load of traffic on roads which creates traffic jam and thereby generate pollution. If we gap of two hours is maintained, vehicular emissions will be reduced immensely. Pressure on buses, autos and metro during peak hours could also be reduced. Staggered work timing means that few offices may open at 8am and some may open at 9am while others may start at 10am. Similarly closing timings will also staggered.Different offices starting and winding up work at different hours will certainly ease the traffic in Delhi-said Khandelwal. Traffic would thereby flow more smoothly, public transport would be utilized more rationally, and the physical and psychological strain would be lessened for all concerned. He said that Singapore has successfully adopted variable timings which started in year 1975.The CAIT has asked Delhi Government to deliberate on the suggestion with all stakeholders. Noted lawyer Shilpi Jain who has represented CAIT in National Green Tribunal said that even Principal Bench of National Green Tribunal headed by Justice Swatantra Kumar also mooted the idea of variable working hours also at one of the hearing at National Green Tribunal and asked the Government to consult all stakeholders but no steps were taken by either Government to study work-ability of the idea.